If you have cooked chicken on hand (or a rotisserie chicken available), these are an easy weeknight dinner. What SHOCKED me, was that while I initially thought they were a little bland until the green chiles “built up” a little, Corrie had nothing but good things to say about these all the way through. Preheat oven to 425 degrees. Mix together 1 cup of the cheese and the chicken. Place an equal amount of the mixture into each tortilla, roll up and place seam side down into a 9 x 13-inch pan. In a skillet or saucepan, melt the butter. Stir in the flour and cook for 1 minute. Add the chicken broth, whisking until smooth. Cook over medium heat until thick and bubbly. Stir in sour cream and green chiles. Pour over the top of the enchiladas; sprinkle with remaining shredded cheese. Bake for 20 to 25 minutes. If not “browned” enough for you, put under the broiler on low for just a minute, but make sure you watch it carefully! Sprinkle with cilantro, if desired. As previously noted, I’m always looking for yummy vegetarian meals. They’re usually easier to throw together last minute…no thawing chicken or having to precook it, plus it’s just a nice change. Not the healthiest meal ever with the various dairy, but we throughly enjoyed it. I may have added a little extra cheese to our topping. 😉 These will be made again! Heat a small amount of olive oil in a large skillet over medium high heat. Add zucchini, bell pepper, and mushrooms and sauté until vegetables begin to soften. Stir in green onions and garlic; cook and stir 30 seconds. Stir in corn, black beans, spinach, chili powder, cumin, and salt and pepper to taste. Transfer mixture to a large bowl. Mix vegetables with cream cheese, 1 cup shredded cheese, 1/2 cup sour cream, and 1/2 cup salsa. Divide evenly among flour tortillas and roll up. Place seam-side down in a greased 9 x 13-inch baking dish. In a separate bowl, combine remaining salsa with 1 cup sour cream. 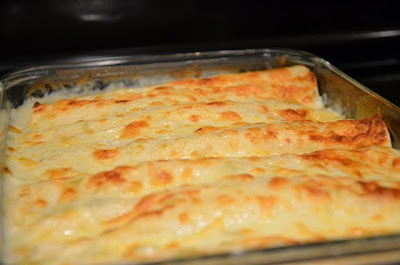 Pour over enchiladas in pan and top with remaining 1 cup cheese. Bake uncovered for 25 minutes or until enchiladas are heated through and cheese is melted.